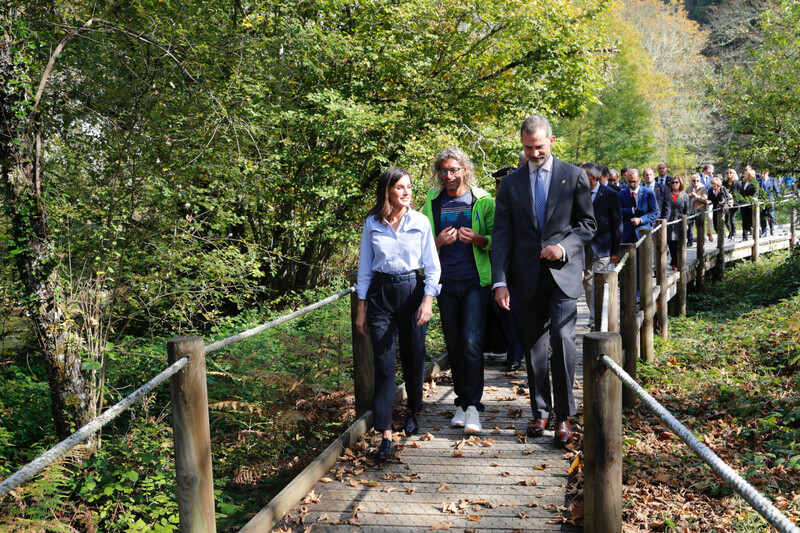 After her stunning appearance at the 2018 Princess of Asturias Awards last night, today Queen Letizia was back to the royal duty with King Felipe. 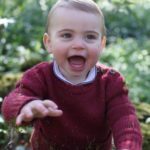 The Royal Couple was out and about to visit the winner of this year’s Exemplary Town Awards – Mual, a village in the parish of Veiga de Rengos. Mual, a municipality of 101 inhabitants, was chosen from a total of 32 towns that were presented, to receive the solemn visit of the King and Queen and to promote some of its most emblematic and characteristic traditions. 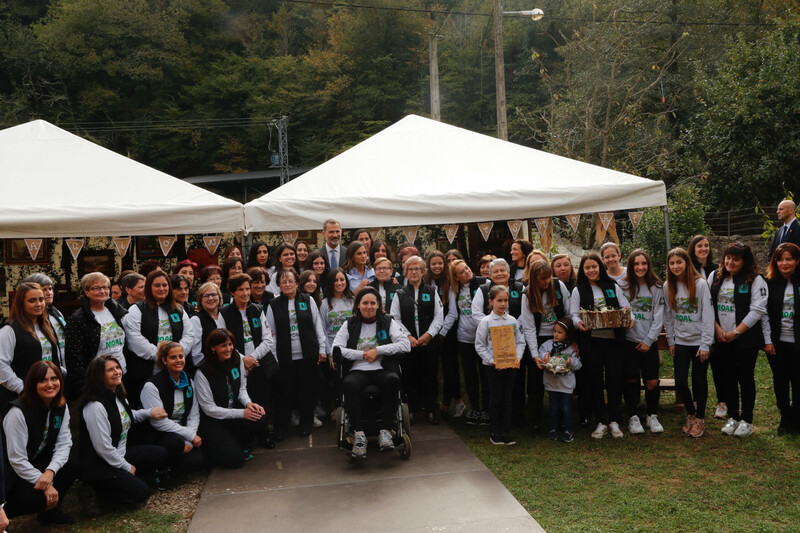 Mual won the 29th edition of Exemplary People of Asturias, for the dedication and work of its inhabitants, for maintaining traditions, conserving and recovering their heritage, protecting their natural environment, improving their quality life, as well as to motivate the return of the emigrants and attracting tourists. In 1982 the town was declared a National Biological Reserve and, in 2002, a World Biosphere Reserve by UNESCO. The couple was received by the mayor of Cangas de Narcea upon arrival and was presented with Baton of Command. 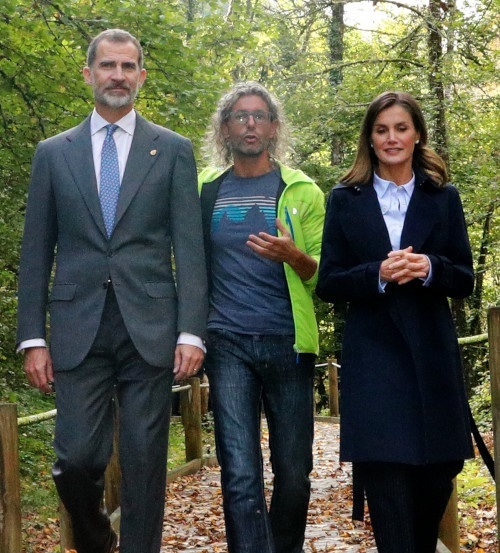 The Felipe and Letizia began the tour of the town. The frist stop was the “Casa Roque” hydraulic mill. The were briefed about the machine that was grinding the wheat for the inhabitants of the region until fifteen years ago. They visited the granary and workshop, in which they were briefed about the fava beans and the enramado of onions. 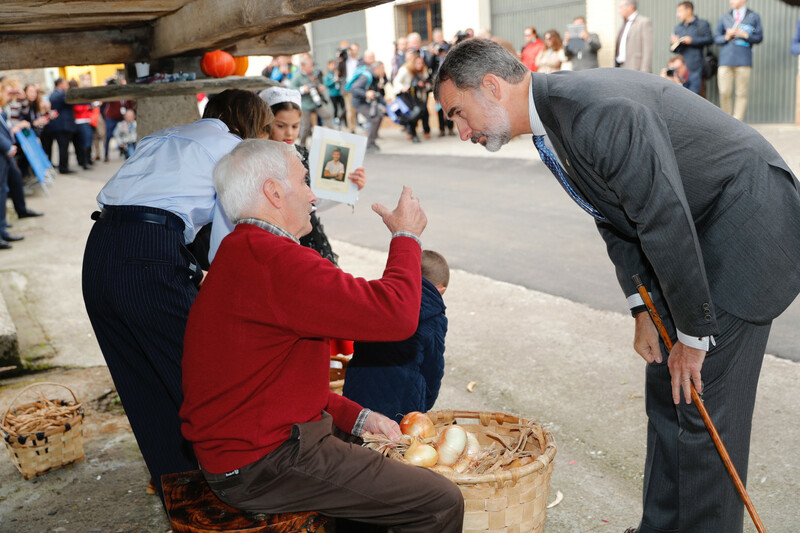 King Felipe talking with Delfino Lago who is preparing the fava beans. During the tour Queen was presented with a bouquet of beautiful autumn flowers by a young girl. Felipe and Letizia’s parental side was seen many times during the walkabout when they were greeted by the kids. Next stop was “prao” La Guerticona where a vaqueiro competition was going on. Vaqueiro is a form of the traditional bowling game in Asturias. 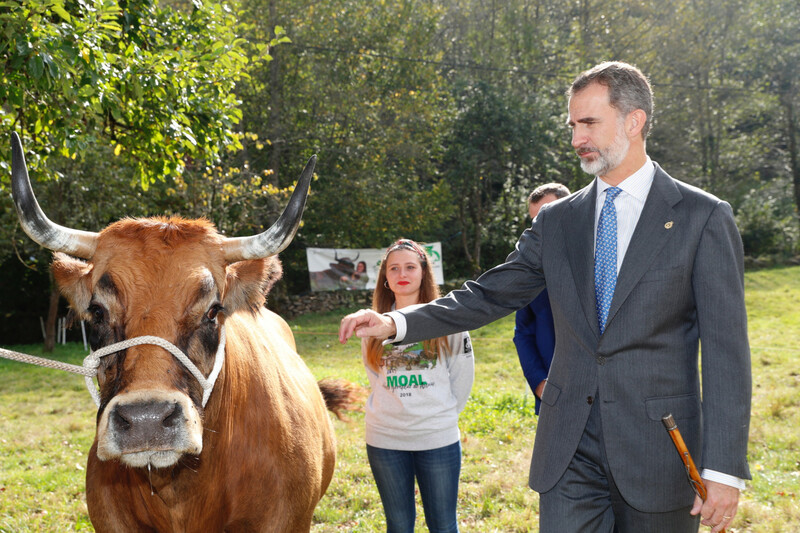 King Felipe tried his hand at the game while Letizia looked at. Next stop was the Puerta de Muniellos, where a mountain race was going on. 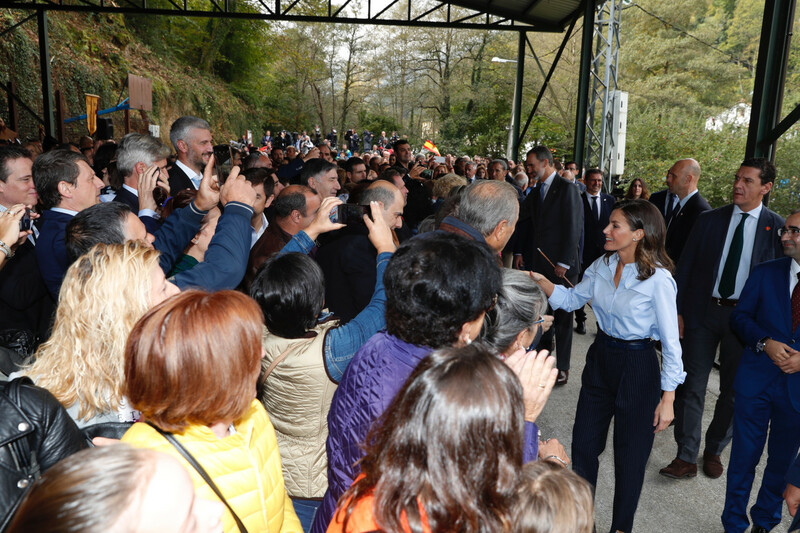 Letizia and Felipe with the members of the mountain race “Puerta de Muniellos”. 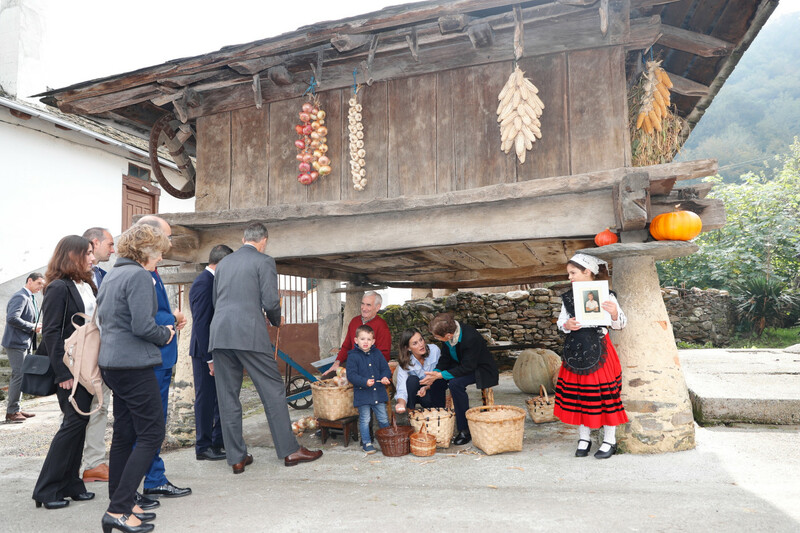 During the visit royal couple was shown the traditional kitchen and the methods of traditional bread baking. 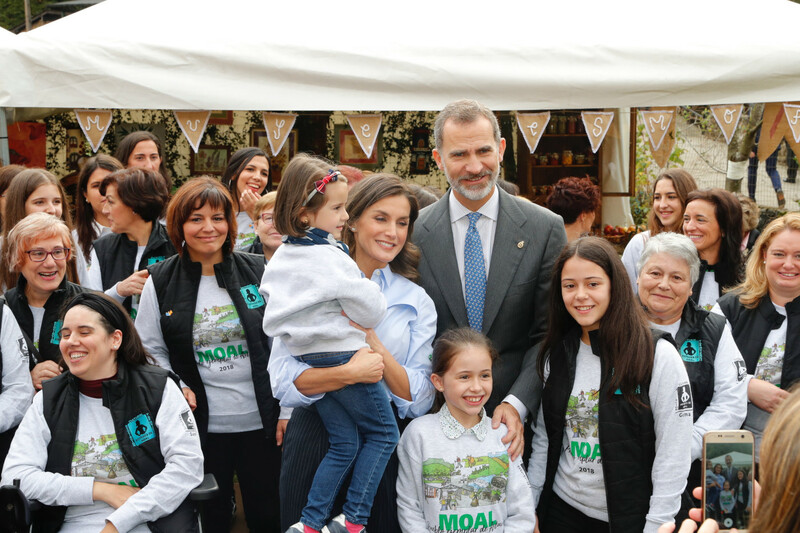 In the end, Felipe and Letizia met with the Mual Association of Women. There they saw the work of the association. The couple received warm gifts from the association. The people of the town were excited and enthusiastic to meet and great the Spanish King and Queen. 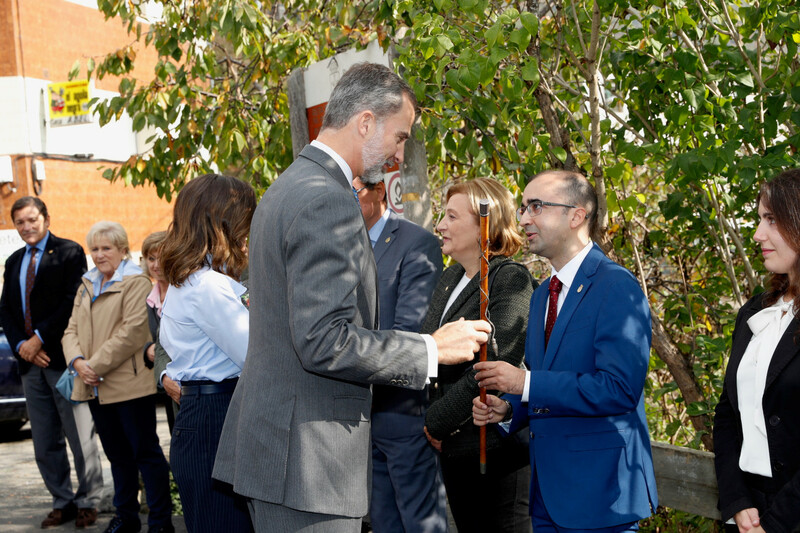 King Felipe unveiled a commemorative plaque in a monolith, to mark the visit and town receiving Princess of Asturias Award of Exemplary Town 2018. 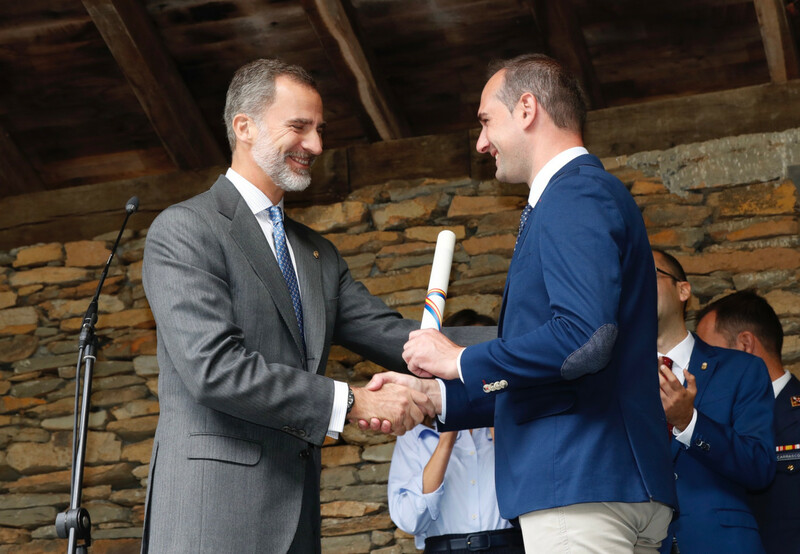 King Felipe presented the award of Exemplary Town of 2018 to the president of the Mual Cultural Association in front of the whole town. Speaking at the event King Felipe said, “The Asturians of the field have made the effort to understand the demands of the current times, you have devised new products, you have risked in the creation of small businesses, you have expanded their markets and sustain with their impulse the expectations of the world rural. Communities, associations, the formed groups are giving new life to the field in Asturias “. 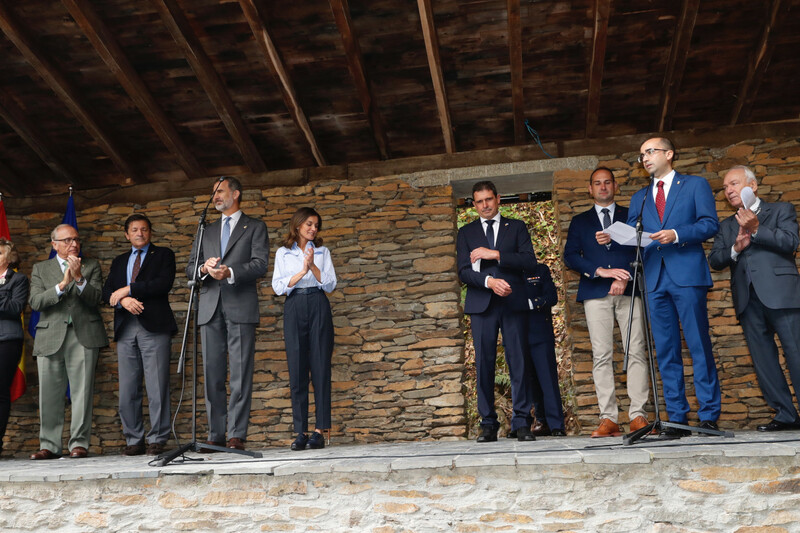 He then stressed that “If the Asturian rural world is alive and has a promising future, it has been by strength and tenacity demonstrated by its inhabitants, because the obstacles are not small. We encourage you not to stop the difficulties, to continue on that path and to look with optimism at the future”. After the award ceremony, the Hymn of Asturias was performed by the Banda de Gaitas de Cangas de Narcea. Then, the King and Queen continued with their tour of the town through the main road of the town where they greeted a group of octogenarians and the president of the project “Young Livestock”, the project director and a young cattle rancher of 18 years, who explained the project to make young women of the agrarian world visible. The couple enjoyed a traditional dance performed by the folk group “Perendengue” from Cangas de Narcea. 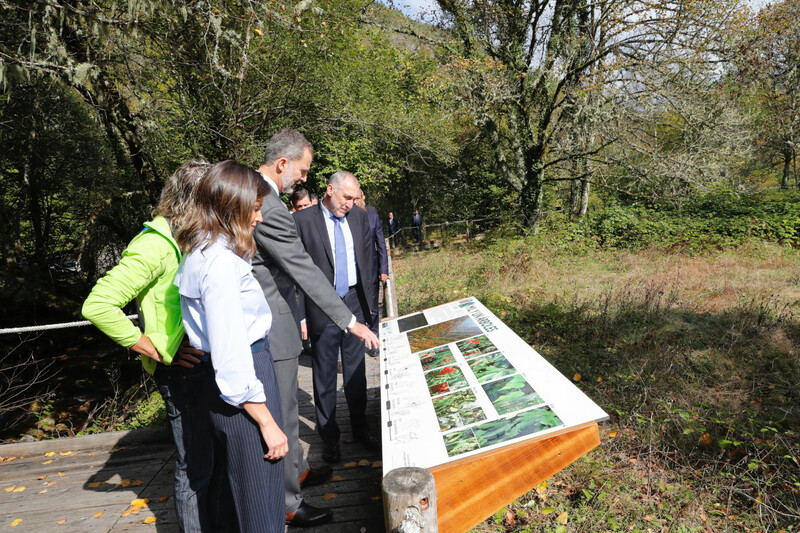 The last stop of the day was the Natural Reserve of Muniellos, where Letizia and Felipe were explained about the history of the the natural reserved area. 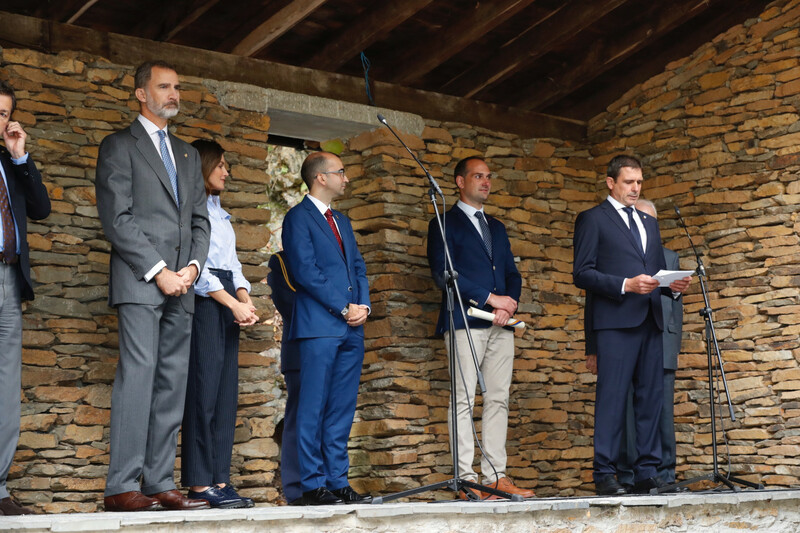 This award presentation ceremony is always the interested activity of King and Queen’s schedule, as it gives an opportunity to visit a new area every year and learn new things about the Spain and its history and geography. Last year it was Poreñu. 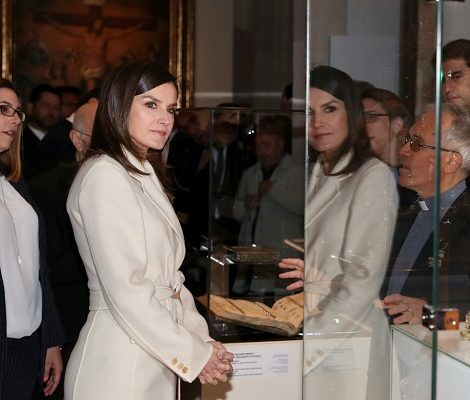 Just like last year Queen Letizia once again chose a very practical and stylish look for the day. 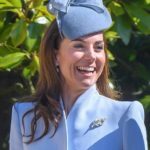 Letizia wore a sky-blue shirt with a blue wide leg stripped trouser that seemed like Hugo Boss wide flared leg trouser. And paired the outfit with black shoes. 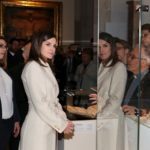 During the tour of natural reserve, Letizia wore a black trench coat. 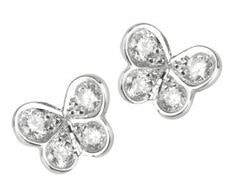 She was wearing her Elena Carrera mini butterfly earrings.